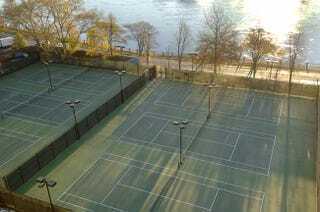 Maybe it’s because I’m a Londoner living in an overcrowded city on a tiny island where courts are in short supply, but I love seeing tennis courts: from a plane as it descends (there never seem to be any on the way up) or from speeding trains and cars. This is a purely aesthetic — i.e., pointless — pleasure, but if I am out walking or cycling, this fondness for court-spotting has obvious practical advantages. Over time, in London, I have discovered every public court within a playable distance of home. …It is in America that you encounter true abundance, both public and private. Descending in a plane over California — or North Carolina or Texas — it seems that tennis courts are more potent than swimming pools as symbols of freedom from the realm of necessity. Which raises the question: What profiteth a man if he gains a world of free courts yet lacks a partner? For life is not just a search for tennis courts; it is also a search for someone to play with.